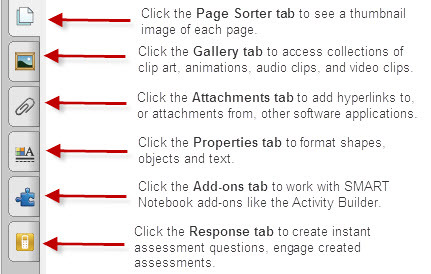 The following information is taken from SMART Technologies Handout, "Toolbars and Tabs in SMART Notebook Software", c. 2012. "The SMART Notebook toolbar consists of the Actions panel, which enables you to browse and make changes to your SMART Notebook file, and the Tools panel, which enables you to create and work with basic objects on the page." The SMART Exchange is an online database of high-quality, peer-reviewed digital content you can use with your SMART software. Join for free in order to download or upload files. Try searching by Texas state standards for a grade and subject. Example results from a search for 3rd grade ELA Writing/Spelling LA.3.110.5.16.A. Click on the image to preview the lesson. Click download to save a copy to your H: drive for personal use. The LISD District M:Drive/LISDComm has SMART Notebook lessons available for staff. It is recommended that a staff member make a copy to their H: drive of any interested SMART activity found on LISDComm/Technology Integration folder/SMART Notebook Activities folder. Professionally developed ELA and Math SMART Notebook lessons for grades K-8 were purchased from OnBoard Academics and are saved to folders in LISDComm/Technology Integration folder/SMART Notebook Activities folder. This page was last modified on 21 November 2013, at 22:51.